Close to nature, uncomplicated, and family-friendly: Camping vacations are rightly very popular. 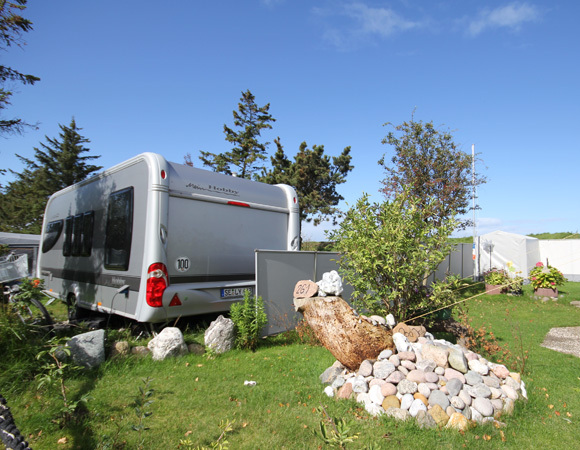 For guests who would like to sample a campsite vacation, we offer well-equipped rental campers at Belt-Camping-Fehmarn. Its location, just behind the dike, promises the most beautiful vacation atmosphere. Arrive, breathe deeply, and don’t miss a thing: Our new rental campers offer maximum living and sleeping comfort for a completely relaxed vacation. The kitchenette in the awning is equipped with dishes, pots, cutlery, and a coffee machine. With the use of a sliding door, individual private rooms for children and parents can be created. We offer five different camper types for up to six people (4 adults + 2 children). Some even come complete with a separate children’s area and a loft bed (types D and E). To ensure that your rental camper stays as hygienic as possible, please bring your own towels, bed linen, blankets and pillows. Pets are allowed by arrangement in specific rental campers. The cost is € 2.00 to € 4.00 per pet, per night.